Teachers have the largest in-school impact on student achievement. We also know that teacher quality has a greater impact on student outcomes than any other factor, including race, socioeconomic status, and prior academic record. In fact, according to researchers Hanushek and Rivken, "having three years of good teachers (85th percentile) in a row would overcome the average achievement deficit between low-income kids on free or reduced-price lunch and others." Yet many districts are struggling—really struggling in some cases—to find enough effective teachers to fill their vacancies each year. According to an October 2018 jobs report from the Economic Policy Institute (EPI), there are 389,000 fewer teachers in the K-12 workforce than are needed to keep up with a growing student population. In the last couple of years, nearly every state in the U.S. has decried teacher shortages. In South Carolina, for example, there were simply not enough qualified teachers to fill positions during the 2017–2018 school year: 6,700 South Carolina teachers left their positions after the 2016–2017 school year, with 4,900 leaving teaching altogether. The Hawaii Department of Education announced it was facing critical teacher employment challenges, citing that the state’s five-year retention rate is only 51% and that they are having a difficult time filling positions: even after the start of the 2018–2019 school year, there were still more than 500 teacher vacancies. In Utah, Governor Gary Herbert addressed his state’s teacher shortage recently with the following plea to his fellow residents: "Consider becoming a teacher; it is a noble profession." Results from Gallup’s 2018 Survey of K–12 School District Superintendents showed that “finding and keeping highly-qualified educators rounds out the top two challenges superintendents face today,” with 65% of rural superintendents strongly agreeing that this is a huge challenge. District leaders, whether in large, small, or rural districts, are struggling to find and retain the teachers they need. There are a number of reasons why school districts are finding teacher recruitment and retention to be a challenge in recent years. Here are five reasons. 1. Women today have greater options in employment than ever before. While the 1970s marked the height of women in the teaching profession, most women during that decade had a limited choice of career types, including “secretarial jobs, bookkeepers, administrative assistants, cashiers, and teachers.” The 1970s also marked a period when more women entered the workforce as primary wage earners. In 1980, for the first time in history, more women than men earned bachelor’s degrees. Today, while the teaching corps in the U.S. is still comprised of 77% women, women in general have more varied employment options, including those in many once-male dominated fields. 2. There is more occupational choice. As unemployment rates decline, high-skilled individuals have more occupational choice. With teacher salaries flat or falling since 2010, many people are not entering teaching, while teachers are leaving education altogether for fields in which there are more career ladder opportunities and earning potential. As of September 2018, the U.S. jobless rate rests at 3.7%—the lowest it has been since December 1969. While the job market is booming, it doesn’t help, as stated in the opening, that there are "389,000 fewer teachers in the K–12 workforce than are needed to keep up with a growing student population," according to Economic Policy Institute. 3. The perception of teaching by the American public and teachers themselves is declining. According to a recent poll conducted by EdChoice, only 27% of parents believe that K–12 education is headed in the right direction. Furthermore, a recent Gallup survey concluded that, for the first time ever, a majority of parents in the United States do not want their kids to become public school teachers. And the trend continues with educators, too. According to a national poll on education, teachers are overall unlikely to recommend teaching as a profession, less so than state legislators or active-duty military personnel. Even more surprisingly, few teachers said they placed much trust in key education players, such as local school boards, state and federal authorities, and even parents—a clear indicator of teachers’ negative perceptions of their field. 4. The pipeline of new teacher candidates is dwindling. Only half the people who graduate from teacher prep programs actually take jobs as new teachers in any given year. Universities are also seeing drops in their enrollment in their schools of education. According to the American Association of Colleges for Teacher Education, "between the 2007-08 and 2015-16 academic years, there was a 23 percent decline in the number of people completing teacher-preparation programs." For example, at the University of Wyoming, enrollment has fallen by 25% over the past several years and since 2010, the University of North Carolina (UNC system) has decreased by 41 percent. 5. The way job seekers look for jobs has radically changed in the last five years, including an increased focus on digital communication and marketing efforts by employers. According to Glassdoor for Employers, 86% of younger job seekers (in any field) who are in the first 10 years of their careers use social media in their job search. In addition, 45% of job seekers use their mobile devices every day in their job search. 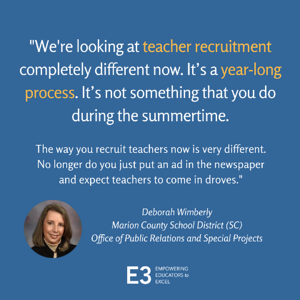 However, due to a myriad of reasons—including outdated policies, budgets, and training—school districts have lagged in keeping pace with current recruiting marketing practices. Even today, the typical school district’s recruitment strategies include—at most—posting the job description on their website (in an often difficult place to find and in bureaucratic language), posting it in their local print newspapers, attending recruitment fairs, and word of mouth. While many of these challenges are beyond the control of districts, there is hope. By prioritizing recruitment and retention in a new, systemic way, we're seeing districts and schools experiencing increased success in finding and retaining those teachers their students desperately need. Here are five ways they are changing how they think about and do this work. 1. They are creating a year-round, multi-stakeholder recruitment system. They recognize that “recruitment and selection is a year-round job that requires creativity and entrepreneurship to make sure that the best candidates are hired” (Gross & DeArmond). Realizing this work can't be done by HR alone, they're building systems that are multi-stakeholder and cross-departmental, too. 2. They start with a deep dive on retention. They know that they can't have success in recruiting effective teachers without first taking a serious look at retention. Recruitment and retention are inextricably linked, and must be continually improved and aligned simultaneously. Without a strong retention system to attract effective teaching candidates, they know that recruitment will be a never-ending, frustrating cycle of trying to find and recruit teachers into a system. They're paying closer attention to why certain groups of teachers are leaving their schools—such as teachers of color who are more likely to leave than their white counterparts—and being intentional about building stronger systems of support. 3. They ask themselves: Are we attracting or discouraging? They are keeping in mind that everything they do is either attracting or discouraging prospective and current teachers. They know that prospective teachers are observing districts—listening to the word of mouth, observing social media presences, and doing searches online. At the same time, they're aware that their current teachers are sharing their experiences with friends and neighbors as well as through their networks on social media. They seek ways to encourage connection and belonging, major keys to retention, such as launching onboarding teams led by teachers at each school to welcome and connect new hires. 4. They are building multi-channel recruitment campaigns. They know recruiting in today's world requires compelling recruitment campaigns that are guided by who specifically they’re trying to attract, the use of the latest in digital marketing tools and tactics, and practicing relationship-building recruiting activities. In a recent Pew Research Center study, 79% of Americans who have looked for employment in the past two years used online resources—and this number is only growing. The most successful districts—especially smaller and/or more rural districts— are now leveraging the power of social media (example 1, example 2), video (example 1, example 2, example 3), webinars (example), and other digital platforms to ensure they are reaching and attracting new candidates that may not know about their districts. 5. They are implementing key levers for school improvement. The bottom line is that successful employee recruitment across industries confirms that organizations "that attract and develop strong employees by prioritizing recruiting, investing in professional growth opportunities, and building positive workplace cultures tend to have greater efficacy and better outcomes," as cited in a report from the Center for American Progress. The work of teacher recruitment and retention is hard, multi-faceted, and ever-changing. But if we're going to see real traction in student achievement, especially in our highest need schools, we must move forward. We must rethink what we've always been doing, take on a learner mindset, and innovate—together. In the end, every one of our students deserves the most effective teachers we can find and retain. By retaining effective teachers, schools can save thousands of dollars every year, maintain positive work environments, and possibly increase student achievement. Learn about three levers that support teacher retention. Available for purchase, this 200+ page Playbook provides concrete, proven next steps for building a year-round, multi-stakeholder recruitment system, including templates, forms, and guides for building an effective recruitment campaign. Anitha, S. & Pearson, R. (2013). Striking women. Lincoln: University of Lincoln. Retrieved from http://www.striking-women.org. Ascione, L. (2018). 5 Key priorities for today’s superintendents. eSchool News. Retrieved from https://www.eschoolnews.com/2018/09/17/5-key-priorities-for-todays-superintendents/. CERRA. (2018). SC teacher recruitment and retention concerns continue. Retrieved from https://www.cerra.org/news/sc-teacher-recruitment-and-retention-concerns-continue. Economy, P. (2015). 11 Interesting hiring statistics you should know. Inc. Retrieved from https://www.inc.com/peter-economy/19-interesting-hiring-statistics-you-should-know.html. Konoske-Graf, A., Partelow, L., & Benner, M. (2016). To attract great teachers, school districts must improve their human capital management systems. Center for American Progress. Retrieved from https://www.americanprogress.org/issues/education-k-12/reports/2016/12/22/295574/to-attract-great-teachers-school-districts-must-improve-their-human-capital-systems/. Jacobson, L. (2018). Jobs report shows shortfall of almost 390,000 teachers. Education Dive. Retrieved from https://www.educationdive.com/news/jobs-report-shows-shortfall-of-almost-390000-teachers. Klanmann, S. (2018). Fewer educators graduating from UW is warning sign of teaching crisis to come, dean warns. Casper Star Tribune. Retrieved from https://trib.com/news/local/education/fewer-educators-graduating-from-uw-is-warning-sign-of-teaching/article_9e088e12-c36b-5306-900b-832c69257830.html. Mahnken, K. (2018). National poll on education attitudes finds majority of teachers down on profession, lack of trust in parents. The 74 Million. Retrieved from https://www.the74million.org/teachers-down-on-profession-lack-trust-in-parents-poll-finds. Mahnken, K. (2018a). 11 Charts that change the way we think about schools. The 74 Million. Retrieved from https://www.the74million.org/article/11-charts-that-changed-the-way-we-think-about-schools-in-2018/. National Center for Education Statistics (SASS). (2018). Fast facts: Teacher trends. Retrieved from https://nces.ed.gov/fastfacts/display.asp?id=28. National Center for Education Statistics (SASS). (2012). Schools and Staffing Survey. Washington, D.C.: U.S. Department of Education. https://nces.ed.gov/surveys/sass/. Putman, H. (2018). What school districts can do to tackle teacher shortages. National Council on Teacher Quality. Retrieved from https://www.nctq.org/blog/What-school-districts-can-do-to-tackle-teacher-shortages. Sanders, W. L., & Rivers, J. C. (1996). Cumulative and Residual Effects of Teachers on Future Student Academic Achievement. University of Tennessee Value-Added Research and Assessment Center. Retrieved from https://www.beteronderwijsnederland.nl/files/cumulative%20and%20residual%20effects%20of%20teachers.pdf. Schmidt, R., Young, V., Cassidy, L., Haiwen W., & Laguarda, K. (2017). Impact of The New Teacher Center’s new teacher induction model on teachers and students. SRI Education. Retrieved from https://newteachercenter.org/wp-content/uploads/NTC_i3-Validation-eval-brief_062017_final.pdf. Smith, A. (2015). Searching for work in the digital era. Pew Research Center. Retrieved from http://www.pewinternet.org/2015/11/19/searching-for-work-in-the-digital-era/. Stringer, K. (2018). New poll: For the first time ever, a majority of American parents do not want their children to become public school teachers. The 74 Million. Retrieved from https://www.the74million.org/new-poll-for-first-time-ever-a-majority-of-american-parents-do-not-want-their-children-to-become-public-school-teachers/. Trading Economics. (2018). US jobless rate down to near 49-year low of 3.7%. Retrieved from https://tradingeconomics.com/articles/10052018123822.htm. Will, M. (2018). Enrollment is down at teacher colleges. So they’re trying to change. Education Week. Retrieved from https://www.edweek.org/ew/articles/2018/08/09/enrollment-is-down-at-teacher-colleges-so.html. Williams, J. (2019, February 01). N.C. teacher shortage hurts ABSS' most vulnerable schools. Retrieved from https://www.thetimesnews.com/news/20190203/nc-teacher-shortage-hurts-abss-most-vulnerable-schools. 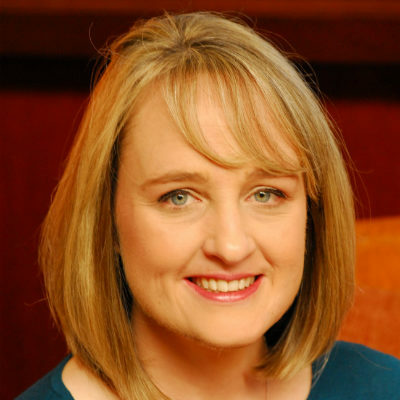 Jill Nyhus is vice president of communications & public policy for Insight Education Group. As a former classroom teacher, start-up entrepreneur, and DC Public Schools’ senior director of technology, she brings her expertise in communications, marketing, educator recruitment, and edtech in role at Insight to lead a wide variety of communication initiatives as well as partnering with schools, districts, and CMOs nationwide to launch and implement educator recruitment and retention systems.